Improve customer convenience & stay compliant with credit card privacy laws. Mobile Cashier is an express e-payment solution for today’s tech-savvy customers on the go. 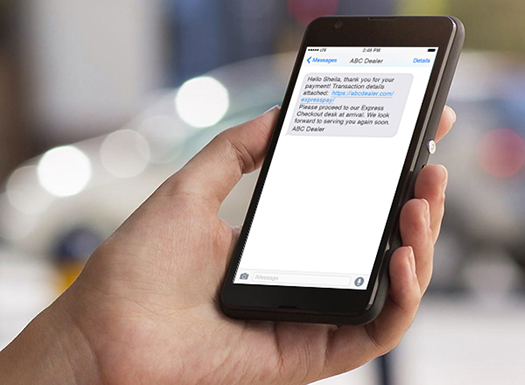 This allows dealerships to positively impact their customers’ service perception — directly on customer’s smartphones! 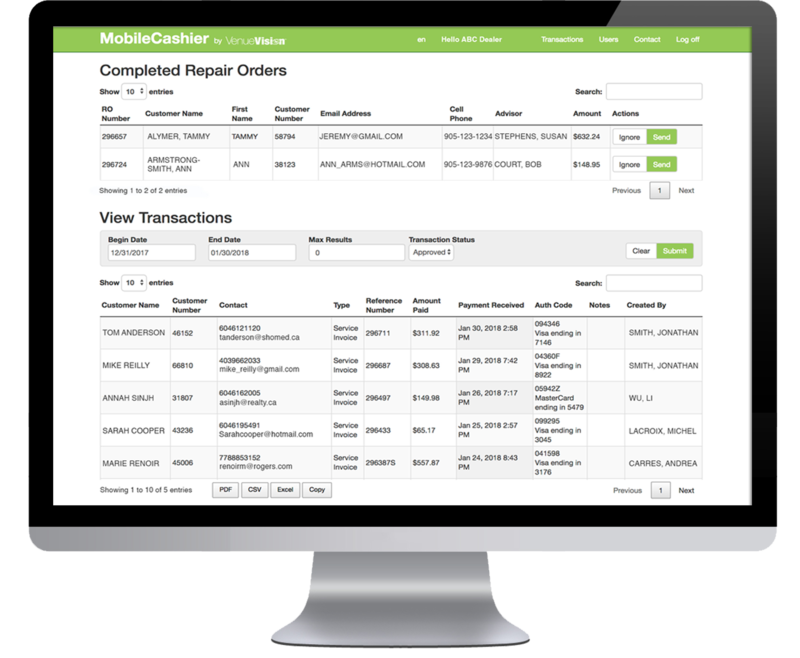 With Mobile Cashier, your customers get dealer-branded text and email notifications of repair completion. Included are secure links to invoice details, allowing them to review specifics and pay for their repair in advance of pickup, giving your customers back valuable time in their day. Additionally, it provides your staff more time to review work completed, inspection reports & next service recommendations. payment page to pay in advance of pickup. directly to customer for their records. How Mobile Cashier Works – E-Payment in 3 Easy Steps! 1. 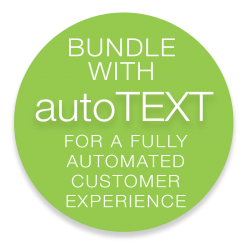 NOTIFY CUSTOMER: Automatically notify customers by text or email once a service repair is complete and ready for pick-up. Notification is sent with invoice details and a link to the dealer branded payment page (pre-populated with the customer’s name, invoice number and invoice amount). 2. E-PAYMENT: The secure payment portal prompts customer to enter credit card information, then submits to complete transaction online. Message is sent which notifies the dealer’s cashier of confirmed payment. 3. CONFIRM PAYMENT: The customer receives an instant text or email confirming payment as well as a formal payment receipt which is emailed to them for their records. They can then pick up their vehicle when convenient. manually send payment links if needed. 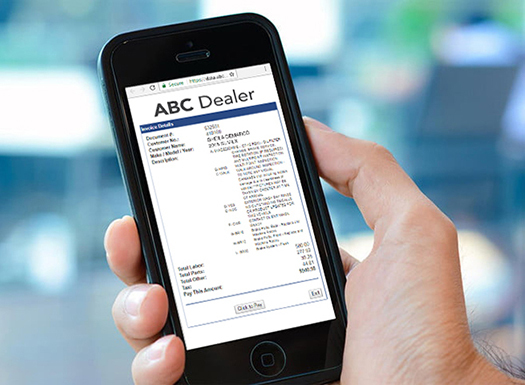 Customers can access the dealer-branded payment page from any mobile device or browser without specialized hardware or app required. On the backend, Mobile Cashier is fully integrated with VenueVision’s service applications, enabling it to complete transactions in real-time. 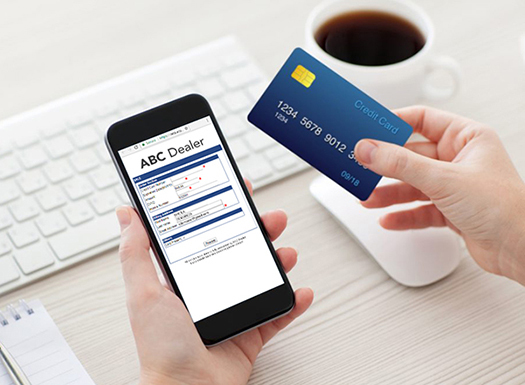 Manual payment links can be sent for all dealership departments. Down payment links and invoices can be sent for New & Used Vehicle Sales and Parts Departments. F&I can send secure links for timely warranty renewals. 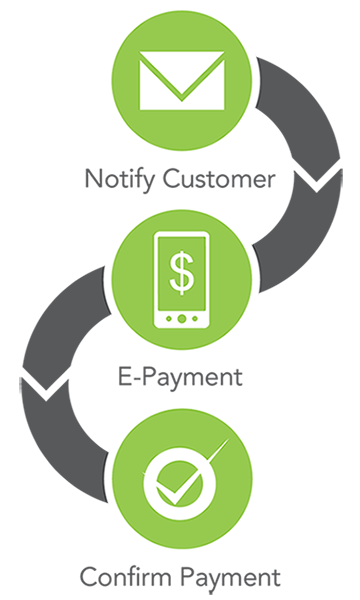 Accounting Departments can speed up receivables collection with personalized payment links. Are your staff members taking credit card information over the phone? This is putting your dealership at risk of being non-compliant with strict privacy laws. Mobile Cashier keeps your systems safe and secure. Your customer’s credit card details are not stored or viewed, which could put them at risk of credit card fraud. DAMS FORD LINCOLN, — Ike P.